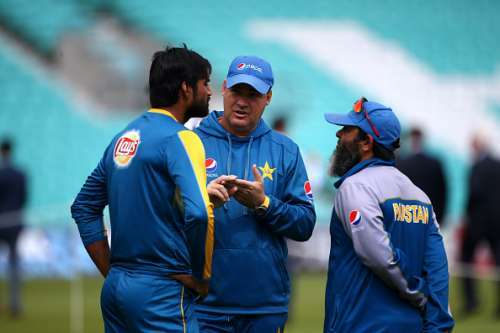 Openly confessing that it was “very frustrating” to see Mohammed Irfan bowl just 5 overs at Headingley before leaving the field, Mickey Arthur has made it very clear to his boys that unfit and under performing players won’t be tolerated in the national squad. Irfan came as a replacement for Mohammed Hafeez who got injured midway through the series. Irfan was looking good at Headingley and managed to claim 2 wickets before going off with cramps. He was later ruled out for the remainder of the tour. “Irfan claimed that he told the head coach that he was fit but was still told to return to Lahore and report at the national cricket academy and be 100 per cent fit for the series against WI,” a source told PTI. The source even suggested that Irfan had even asked the team management and trainers to take his fitness test. “Irfan is unhappy because he feels that the coach did not take his word and trusted him on his fitness,” the source said. Millions of viewers saw Mickey Arthur getting very angry and upset when Irfan walked off the field with a calf strain after bowling only 5 overs. Even in the case of Hafeez, Arthur had made it very clear that no unfit players would be allowed to travel with the team. The opening batsman is undergoing rehabilitation at the National Cricket Academy (NCA). “In the past, some players used to hide their fitness issues in conjunction with the PCB medical panel and also by befriending the national team’s trainer or physio,” the source said. However, the culture seems to be changing after Arthur became the coach of the Pakistan team. He has brought in his own fielding coach Steve Rixon and trainer Shane Hayes. Arthur was bemused to know that Irfan was sent to England without checking his fitness to chief selector Inzamam-ul-Haq and a senior board official. Pakistan started off the Test series against England in a dramatic fashion, registering a win at the Mecca of Cricket. Misbah-ul-Haq became the oldest Test cricketer to score a century and courtesy Yasir Shah’s 10 wicket haul in the match, Pakistan won the match by 75 runs. The visitors’ performances dipped in the next two tests as they were annihilated by the English side inflicting huge victories in the 2nd and the 3rd Test. Arthur criticized his side for not maintaining the momentum and took a dig at the underperforming players. Fortunately, Pakistan came back strongly in the final Test and again it was the tormentor from the Lord’s Test Yasir Shah who was the wrecker in chief. The win also enabled Pakistan to climb to the top of the ladder in the latest ICC Test rankings and it is also the 1st time in their cricketing history that Pakistan has achieved this feat.